Book Seven of the Republic offers Plato’s allegory of the cave, arguably one of the most known philosophical concepts, even to those outside of philosophy. Reality — the idea of forms, in this case, the shadows reflected on the wall in front of the prisoners — is distorted within the cave, but outside of the cave, where true ascent to knowledge is feasible, exists true reality and therefore, the true ideal of its forms and representations, most commonly depicted as the sun being the conveyer of truth and knowledge. The deeper concept here, however, is that the masses are not only ignorant, like the prisoners in the cave, but if one were to return from outside the cave to the inside to, as perhaps a Christian may say, spread the word of true reality (after all, there’s a natural inclination to want to tell someone else about the good life or a good insight, if one thinks they have found it), they would be shunned, ridiculed and perhaps physically accosted for trying to impinge upon the ignorance. In other words, the ignorant are steadfastly protective of their ignorance for it is comforting. Therefore, Plato asserts that the masses need philosophers equipped with the nature of true reality and knowledge to guide the people. On one hand, I agree with the allegory of the “cave” itself as a representation of the folly of utilizing sensory perception in place of philosophical reasoning, i.e., seeing is not really believing. But, this interpretation by Plato of the masses and extrapolation therein of how we ought to arrange society and its structures is inherently flawed. To be more clear, I’m saying Plato’s ideal of the just society and its arrangement, as depicted in my interpretation of the cave allegory, is flawed. Before getting to that fundamental problem, though, it is first necessary to examine the deus ex machina that Plato employs for the allegory itself: who frees the prisoner that then goes on to become something of a philosopher king? The previously freed philosopher king? Clearly, we can keep going back and back on that point. Socrates says to Glaucon, “When one was freed and suddenly compelled to stand up” (515c5). I find this an important point to consider because the allegory itself is arguing that there is a path to enlightenment and that enlightenment exists within a space beyond our normal perceptions, but Plato is lacking in how exactly we get onto that path and therefore, off of the current path of normal, false perceptions. I could go even further here, though. While there’s an obvious meditation on propaganda inherent to the allegory, i.e., whoever it is that’s displaying the shadows to the prisoners, whether it represents government, educators, mass media and so forth and therefore, a question of where the line between indoctrination and teaching is. However, there’s also another question to ponder: the freeing of someone’s ignorance. There’s a clearly outlined pain to being free of ignorance and there’s a duty to free people of that ignorance, but can we literally force and/or coerce them out of that ignorance? And in doing so, does that somewhat invalidate the goodness of the “gospel” of it, if force is required? If it is so good, is not good enough on its own merits to free someone of chains without literally forcing them free? My point of reference here is 515c and d, where Socrates repeatedly says “if he were compelled.” This point of force versus persuasion will be instructive to my larger point about how society ought to be arranged as the paper progresses. Plato does offer us a different model, which counters compelling the prisoner away from the cave. 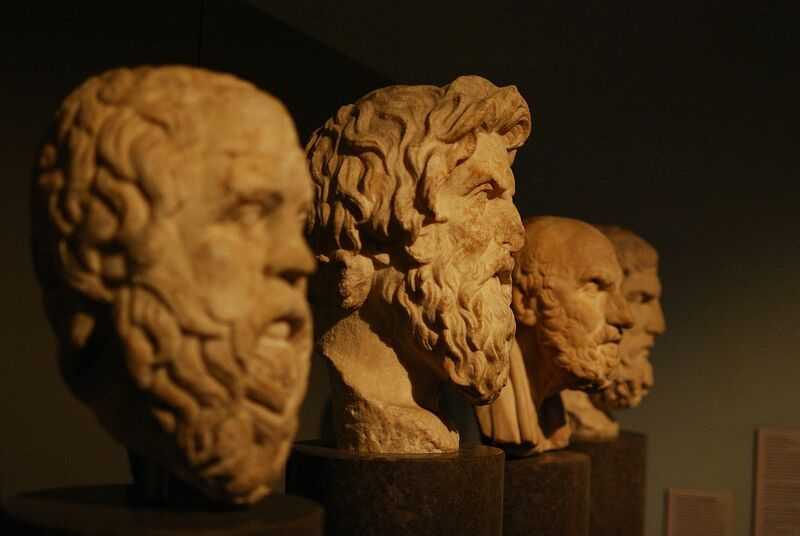 Socrates says, “They [those who boast about what education can do] say that they can pretty much put knowledge into souls that lack it, like putting sight into blind eyes” (518b5). This is a clear rejoinder to compelling. Plato gets at the ideal type of rule on 520d, where he says, “A city in which those who are going to rule are least eager to rule is necessarily best and freest from faction, whereas a city with the opposite kind of rulers is governed in the opposite way.” There are two points to consider here. First, this is certainly utopian, as those least likely to want to rule will not seek to rule. Only those that seek power will be drawn to positions that give them such power. Secondly, there is a third alternative to both of these (those who seek to rule and those who do not) and that’s no rulers at all. One reason to side with the concept of no rulers is the knowledge problem itself. Even those outside the cave could never be sure to possess the totality of true knowledge and then be wise enough to disseminate it to the masses through the prism of power. Friedrich A. Hayek’s article, “The Use of Knowledge in Society” is instrumental to my thinking here. While Hayek utilizes the knowledge problem to posit the folly of controlling an economy, the knowledge problem extends far beyond just that paradigm. Hayek says, “An essential part of the phenomena with which we have to deal: the unavoidable imperfection of man’s knowledge and the consequent need for a process by which knowledge is constantly communicated and acquired.” Freeing oneself of a cave-dwelling existence (or if someone “compelled” them to freedom) does not negate this problem of man’s imperfection for knowledge accumulation. My argument is on two fronts, then. Even the philosopher, free of the cave and imprisonment to true reality, cannot possibly possess the necessary totality of knowledge. However, even if somehow that were possible, it still does not follow that the one with true knowledge ought to rule and have dominion over others. If that knowledge is truly good, then it would follow that rule would be unnecessary. In a truly just society, there would be no need to establish a formulation of rulers and the ruled, whether the former sought it or not. All of which, brings me back to the question of force versus persuasion. If one is positing a society of rulers and the ruled, then one is necessarily siding with force over persuasion in the pursuit and application of the good. Despite, that is, Socrates asserting how foolish it is to instill the good within someone. In fact, Socrates tells us that there exists within the soul of all men the power to learn (518c5). If it is within all of us to learn about the good life, then it would seem to me assigning power to a select few of us is establishing a hierarchy that need not be there and serves no useful purpose. Philosophers working to spread the world voluntarily, even if it may be fraught with danger, is a preferable option to instilling within the philosopher power over others — power which necessarily taints the inherent goodness of the good life. Hayek, Friedrich A. “The Use of Knowledge in Society | Foundation for Economic Education.” FEE Freeman Article. Foundation for Economic Freedom, 1 May 1996. Web. Would you let your 8-year-old child rule himself? H, are you suggesting adults are comparable to children?